Yoqneam, Israel, July 6, 2017 — MIND C.T.I. LTD. (NasdaqGM:MNDO), a leading provider of convergent end-to-end prepaid/postpaid billing and customer care product based solutions for service providers as well as unified communications analytics and call accounting solutions for enterprises, today announced the availability of PhonEX ONE on the Azure marketplace to offer Call Accounting and Unified Communication Analysis. Azure Marketplace is an online store for buying and selling quality Software as a Service (SaaS) applications, cloud resources and virtual servers for the enterprise. 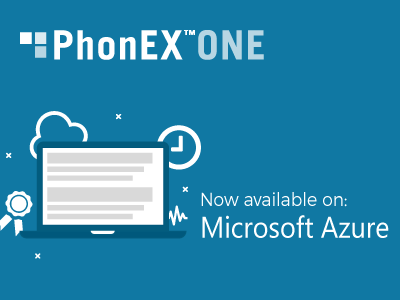 PhonEX ONE was optimized to run on Azure, Microsoft’s cloud platform, enabling Azure marketplace users to implement the call accounting and UC analytics tool in just a few clicks. PhonEX ONE provides in-depth unified communication analytics and call accounting data and supports multiple types of communication platforms such as Skype for Business, Cisco UCM 11, Avaya Aura, Unify, Mitel and many more. PhonEX ONE fits organizations of all sizes, from small contact centers to multinational corporations. Contact centers utilize PhonEX ONE to receive real-time monitoring about their agent’s performance while enterprises use their product to simplify the organization’s communication traffic analysis, resource utilization and optimization. With over 20 years of experience and more than 20,000 installations, MIND has built the ultimate solution using the latest state-of-the-art technologies in a multitenant architecture. PhonEX ONE is uniquely positioned as a unified communication analysis and call accounting solution provider to high-end corporations and global enterprises.